"When Israel tries to tango with Abbas, we find ourselves abandoned on the dance floor," says Israeli Ambassador Prosor. Israel’s Ambassador to the United Nations, Ron Prosor, warned world nations on Tuesday that with the Hamas-Fatah unity pact, any funds they transfer to the Palestinian Authority (PA) may end up in the hands of Hamas and be used for carrying out terrorist attacks. “As we speak, millions of dollars are being channeled to the Palestinian Authority. 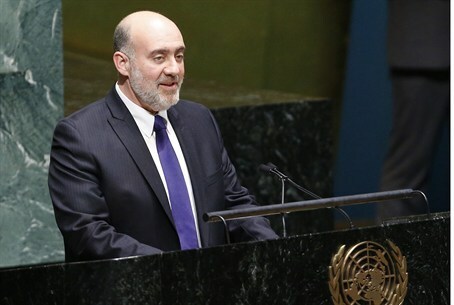 Now that the Palestinians have signed a unity agreement, that funding will be at the disposal of Hamas, an internationally recognized terrorist organization,” Prosor said in a speech before the UN Security Council. “I wonder how taxpayers in London, Luxembourg and Paris would feel knowing that they will enable Hamas to launch more rockets into Israel, kidnap more Israelis, and send more suicide bombers into our cafes,” he added. “Not a day goes by in which Hamas does not seek Israel’s destruction. Last month, the Israeli Defense Force intercepted a cargo ship sent by Iran and carrying advanced weaponry destined for the Hamas controlled Gaza Strip. The weapons included rockets, ammunitions, and missiles capable of striking the very heart of Israel. “The international community is quick to condemn Israel, but never says a word when Israel is the victim of unrelenting attacks,” said Prosor, adding, “How many times has the international community criticized Israel for restricting the entry of certain dual-use goods into Gaza? You don’t have to be Christopher Columbus to discover that a second country borders Gaza, yet it is never mentioned by this Council. “And how many times has this Council criticized Israel for restricting the entry of construction materials? And yet, when Israel does allows cement into Gaza, instead of building the Palestinian people up, Hamas is committed to tearing Israel down. They could be using the cement to build schools, homes, and hospitals, but instead they build terror tunnels to smuggle weapons and attack Israel,” he said. “Before taking a single step towards the negotiating table, the Palestinian leadership demands that Israel submit to substantial concessions. Once Israel agrees, they drag their feet and evoke every delay tactic in the book. And then, as the deadline approaches and courageous leadership decisions are required, Abbas deserts the talks,” said Prosor. “He did so in 2008. After the Israeli Prime Minister offered an unprecedented and far-reaching peace deal, the Palestinians simply walked away. “He did it again in 2009. Prime Minister Netanyahu courageously extended an olive branch to the Palestinians in his historic Bar-Ilan speech and agreed to a ten month settlement freeze. The Palestinians stalled and did not reciprocate. “In February 2012 – surprise, surprise – just as we were on the verge of a breakthrough, Abbas abandoned the talks and flew to Doha to sign a unity deal with Hamas, an internationally recognized terrorist organization. And then, a few months later, the Palestinian leadership went to the UN seeking to bypass direct negotiations,” noted Prosor. “The Palestinian leadership recently broke its commitment by applying to join 15 international treaties and conventions. It seems to me that they have forgotten that they also have to abide by these treaties and address the rampant persecution of women, children and minorities in Palestinians society,” he said.